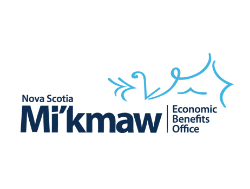 The Mi’kmaw Economic Benefits Office (MEBO) has had great success in creating partnerships with large industry across Nova Scotia and in doing so identify both employment and business opportunities for local Aboriginals. MEBO works to prepare and support both individuals and Aboriginal businesses to be part of these opportunities. The Benefits Office will help industry find the workers they need through promotion and recruitment efforts and provide training when necessary. MEBO serves all five First Nation communities in Cape Breton (Unama’ki) and takes a collaborative and business approach to employment and business opportunities with large industry in the region. MEBO brings a solution to the table for industry, a proven process to help them successfully engage Aboriginals and build upon their skilled workforce. MEBO has developed a more strategic and results driven approach to Aboriginal engagement. Since 2008, MEBO has delivered a very successful series of training programs for Mi’kmaq communities and this is clearly demonstrated by the hundreds of jobs it helped create for local Aboriginals. The success of this training program over the last six years, first under ASEP and now with our Skills Partnership fund (SPF) under Service Canada, has resulted in more than 900 Aboriginals being trained and helped create more than 400 jobs.